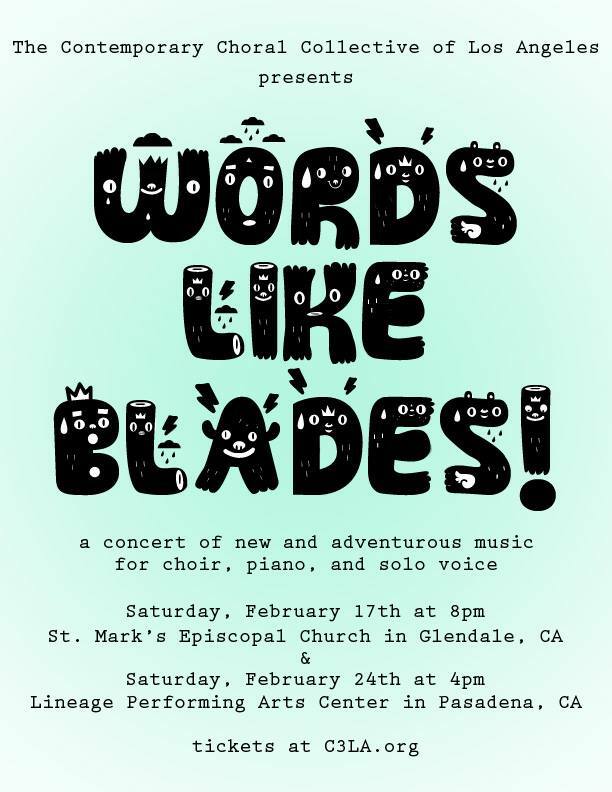 The Contemporary Choral Collective of Los Angeles (C3LA), in conjunction with the Sound & Fury Concert Series, presents WORDS LIKE BLADES, a program of new and adventurous choral music focused on art songs, as well as the power of stories, fables and myths. Join C3LA for the second concert series of their 2nd full season, WORDS LIKE BLADES, as the group delves into and reconstructs poetry by Apollinaire, Emily Dickinson, Charles Erskine Scott Wood, and Susan Jordan, as well as pieces inspired by John Cage’s Lectures on Nothing and the art of Julie Mehretu. The concert will feature choral pieces by Joshua Harris (Blackbirds Rise), Francis Kayali (Celebration of the Sun), Patrick Behnke (once on never recur over), and C3LA composers Allen Menton (Pretty Words Like Blades – world premiere), Amy Golden (Construction After Mehretu – world premiere), Amy Gordon (Magic), TJ Sclafani (oublier – world premiere), and Fahad Siadat (Who is this Boy?). The concert will also feature three world premiere art songs by C3LA composers Molly Pease, Jocelyn Scofield, and Kat Shuman. The performance on February 24th is produced in conjunction with the Sound and Fury Concert Series and will additionally include world premiere art songs by Christian Dubeau and Patrick Gibson. A reception will follow the concert.